Authored by Andrew Wakefield and 12 others, the paper’s scientific limitations were clear when it appeared in 1998.2 3 As the ensuing vaccine scare took off, critics quickly pointed out that the paper was a small case series with no controls, linked three common conditions, and relied on parental recall and beliefs.4 Over the following decade, epidemiological studies consistently found no evidence of a link between the MMR vaccine and autism.5 6 7 8 By the time the paper was finally retracted 12 years later,9 after forensic dissection at the General Medical Council’s (GMC) longest ever fitness to practise hearing,10 few people could deny that it was fatally flawed both scientifically and ethically. But it has taken the diligent scepticism of one man, standing outside medicine and science, to show that the paper was in fact an elaborate fraud. Deer published his first investigation into Wakefield’s paper in 2004.12 This uncovered the possibility of research fraud, unethical treatment of children, and Wakefield’s conflict of interest through his involvement with a lawsuit against manufacturers of the MMR vaccine. Building on these findings, the GMC launched its own proceedings that focused on whether the research was ethical. But while the disciplinary panel was examining the children’s medical records in public, Deer compared them with what was published in the Lancet. His focus was now on whether the research was true. The Office of Research Integrity in the United States defines fraud as fabrication, falsification, or plagiarism.13 Deer unearthed clear evidence of falsification. He found that not one of the 12 cases reported in the 1998 Lancet paper was free of misrepresentation or undisclosed alteration, and that in no single case could the medical records be fully reconciled with the descriptions, diagnoses, or histories published in the journal. Meanwhile the damage to public health continues, fuelled by unbalanced media reporting and an ineffective response from government, researchers, journals, and the medical profession.17 18 Although vaccination rates in the United Kingdom have recovered slightly from their 80% low in 2003-4,19 they are still below the 95% level recommended by the World Health Organization to ensure herd immunity. In 2008, for the first time in 14 years, measles was declared endemic in England and Wales.20 Hundreds of thousands of children in the UK are currently unprotected as a result of the scare, and the battle to restore parents’ trust in the vaccine is ongoing. There are hard lessons for many in this highly damaging saga. Firstly, for the coauthors. The GMC panel was clear that it was Wakefield alone who wrote the final version of the paper. His coauthors seem to have been unaware of what he was doing under the cover of their names and reputations. As the GMC panel heard, they did not even know which child was which in the paper’s patient anonymised text and tables. However, this does not absolve them. Although only two (John Walker-Smith and Simon Murch) were charged by the GMC, and only one, the paper’s senior author Walker-Smith, was found guilty of misconduct, they all failed in their duties as authors. The satisfaction of adding to one’s CV must never detract from the responsibility to ensure that one has been neither party to nor duped by a fraud. This means that coauthors will have to check the source data of studies more thoroughly than many do at present—or alternatively describe in a contributor’s statement precisely which bits of the source data they take responsibility for. Secondly, research ethics committees should not only scrutinise proposals but have systems to check that what is done is what was permitted (with an audit trail for any changes) and work to a governance procedure that can impose sanctions where an eventual publication proves this was not the case. Finally, there are lessons for the Royal Free Hospital, the Lancet, and the wider scientific community. These will be considered in forthcoming articles. What of Wakefield’s other publications? In light of this new information their veracity must be questioned. Past experience tells us that research misconduct is rarely isolated behaviour.25 Over the years, the BMJ and its sister journals Gut and Archives of Disease in Childhood have published a number of articles, including letters and abstracts, by Wakefield and colleagues. We have written to the vice provost of UCL, John Tooke, who now has responsibility for Wakefield’s former institution, to ask for an investigation into all of his work to decide whether any more papers should be retracted. The Lancet paper has of course been retracted, but for far narrower misconduct than is now apparent. The retraction statement cites the GMC’s findings that the patients were not consecutively referred and the study did not have ethical approval, leaving the door open for those who want to continue to believe that the science, flawed though it always was, still stands. We hope that declaring the paper a fraud will close that door for good. Competing interests: All authors have completed the Unified Competing Interest form at www.icmje.org/coi_disclosure.pdf (available on request from the corresponding author) and declare: no support from any organisation for the submitted work; no financial relationships with any organisations that might have an interest in the submitted work in the previous three years. HM chairs GMC fitness to practise panels. He had no association with the Wakefield hearings and the views expressed in this article are his own and do not represent those of the GMC. Schechter AN, Wyngaarden JB, Edsall JT, Maddox J, Relman AS, Angell M, et al. Colloquium on scientific authorship: rights and responsibilities. FASEB J1989;3:209-17. Wakefield AJ, Murch SH, Anthony A, Linnell, Casson DM, Malik M, et al. Ileal lymphoid nodular hyperplasia, non-specific colitis, and pervasive developmental disorder in children [retracted]. Lancet1998;351:637-41. Chen RT, DeStefano F. Vaccine adverse events: causal or coincidental? Lancet 1998;351:611-2. Payne C, Mason B. Autism, inflammatory bowel disease, and MMR vaccine. Lancet1998;351:907. Black C, Kaye JA, Jick H. Relation of childhood gastrointestinal disorders to autism: nested case­control study using data from the UK General Practice Research Database. 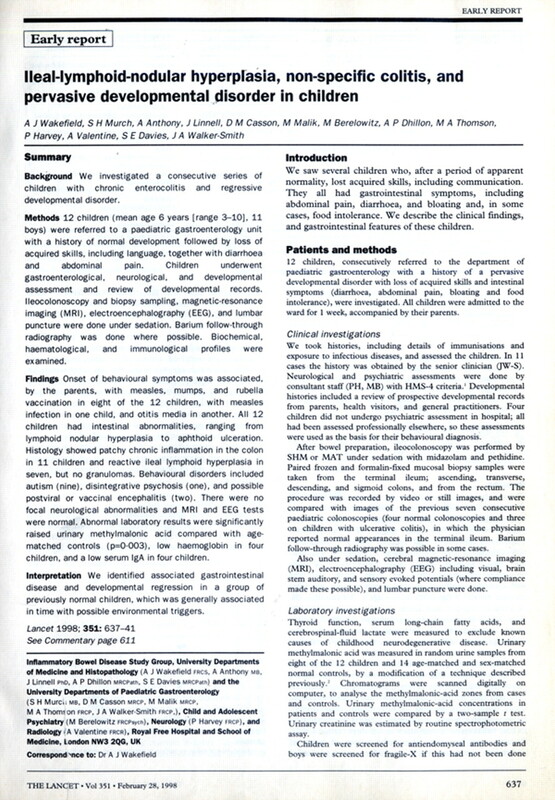 BMJ2002;325:419-21. Taylor B, Miller E, Lingam R, Andrews N, Simmons A, Stowe J. Measles, mumps, and rubella vaccination and bowel problems or developmental regression in children with autism: population study. BMJ2002;324:393-6. Madsen KM, Hviid A, Vestergaard M, Schendel D, Wohlfahrt J, Thorsen P, et al. A population-based study of measles, mumps, and rubella vaccination and autism. N Engl J Med2002;347:1477-82. Honda H, Shimizu Y, Rutter M. No effect of MMR withdrawal on the incidence of autism: a total population study. J Child Psychol Psychiatry2005;46:572-9. The editors of the Lancet. Retraction—Ileal-lymphoid-nodular hyperplasia, non-specific colitis, and pervasive developmental disorder in children. Lancet2010;375:445. Transcripts of hearings of fitness to practise panel (misconduct) in the case of Wakefield, Walker-Smith, and Murch, 16 July 2007 to 24 May 2010. GMC; 2010. Deer B. Secrets of the MMR scare: how the case against the MMR vaccine was fixed. BMJ2011;342:c5347. Deer B. Revealed: MMR research scandal. Sunday Times2004 February 22. www.timesonline.co.uk/tol/life_and_style/health/article1027636.ece. Office of Research Integrity. Definition of research misconduct. http://ori.hhs.gov/misconduct/definition_misconduct.shtml. GMC. Andrew Wakefield: determination of serious professional misconduct 24 May 2010. www.gmc-uk.org/Wakefield_SPM_and_SANCTION.pdf_32595267.pdf. Murch SH, Anthony A, Casson DH, Malik M, Berelowitz M, Dhillon AP, et al. Retraction of an interpretation. Lancet2004;363:750. Shenoy R. Controversial autism researcher tells local Somalis disease is solvable. Minnesota Public Radio2010 December 17. http://minnesota.publicradio.org/display/web/2010/12/17/somali-autism. Hilton S, Hunt K, Langan M, Hamilton V, Petticrew M. Reporting of MMR evidence in professional publications: 1988–2007. Arch Dis Child2009;94:831-3. Bedford HE, Elliman DAC. MMR vaccine and autism. BMJ2010 Feb 2;340:c655. Health Protection Agency. Completed primary course at two years of age: England and Wales, 1966-1977, England only 1978 onwards. http://www.hpa.org.uk/web/HPAweb&HPAwebStandard/HPAweb_C/1195733819251. Health Protection Agency. Confirmed cases of measles, mumps and rubella 1996-2009. http://www.hpa.org.uk/web/HPAweb&HPAwebStandard/HPAweb_C/1195733833790. Jick H, Chamberlin DP, Hagberg KW. The origin and spread of a mumps epidemic: United Kingdom, 2003-2006. Epidemiology2009;20:656-61. Kutty PK, Kruszon-Moran DM, Dayan GH, Alexander JP, Williams NJ, Garcia PE, et al. Seroprevalence of antibody to mumps virus in the US population, 1999-2004. J Infect Dis2010;202:667-74. Roggendorf H, Mankertz A, Kundt R, Roggendorf M. Spotlight on measles 2010: measles outbreak in a mainly unvaccinated community in Essen, Germany, March-June 2010. Euro Surveill2010;15:2. http://www.eurosurveillance.org/ViewArticle.aspx?ArticleId=19605. Oakley GP, Johnstone RB. Balancing the benefits and harms in public health prevention programmes mandated by governments. BMJ2004;329:41-3. Rennie D. Misconduct and journal peer review. In: Godlee F, Jefferson T eds. Peer Review in Health Sciences, 2nd ed. BMJ Books; 2003. p 118-129.